Lucy serves as the center manager and is responsible for the day-to-day leadership and general management of the company. She is passionate about creating a warm, welcoming environment and providing clients with the optimal level of support and care, tailored to meet each individual child’s need. 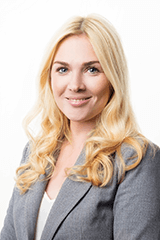 Lucy has spent over 9 years in the education sector in both practitioner and managerial roles. Prior to completing her Leadership and Management qualifications, she trained and qualified ​as an Early Year’s Educator in the UK. She has worked in various roles within the early year’s sector including senior practitioner and coordinator. Along with many other leadership responsibilities, Lucy designed and constructed the learning environment for the early year’s provision, understanding the crucial role it has in children’s learning and development and the effects it can have on their mood, ability to form relationships and their health. Lucy is a strong advocate of the learning opportunities young learners react best to. She has previously helped shape the way that learning is presented, making it an exciting and entertaining aspect of the day. Lucy has used her time in Qatar to develop her own skills and her approach to the education of children, drawing upon the rich experiences of other nationalities and the best practices of international organizations. She has mentored and guided new colleagues and recruited a strong team who have the skills to succeed in a fast developing environment. Lucy sees young learners as the future generation who will continue to build an ever better society for us all. With the right support and the correct stimulation, they will unlock their potential in all future endeavors.